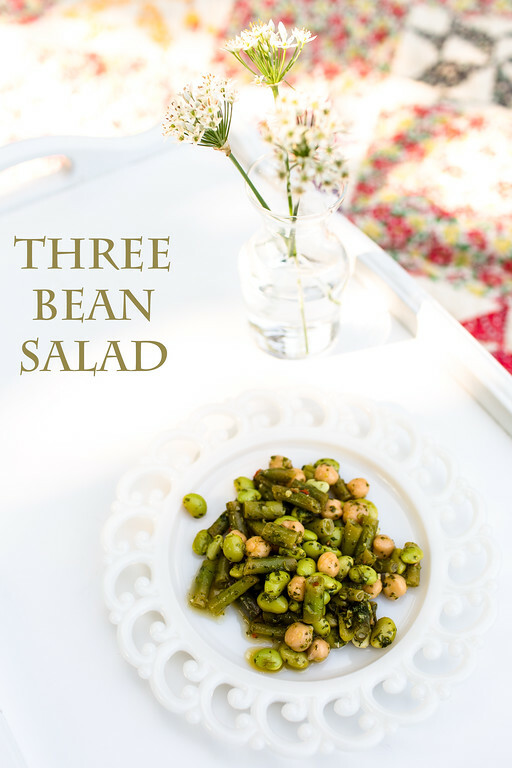 Well, it wouldn’t be a picnic without a three bean salad! But this is not your mother’s three bean salad! This includes edamame, chickpeas and cilantro, ingredients my mother probably has never used, even today. This was such a refreshing change of pace from the usual bean salads. I love the blend of the different beans and the cilantro dressing really freshens it up. Though if you are one of those cilantro haters (so sorry! ), you can omit that or substitute parsley or some other mild green herb. I found this in Gourmet Today: More than 1000 All-New Recipes for the Contemporary Kitchen – a cookbook I find myself turning to more and more. Like most bean salads, this was even better the next day! The flavors blended beautifully! Perfect for a picnic or to pack in your lunch! 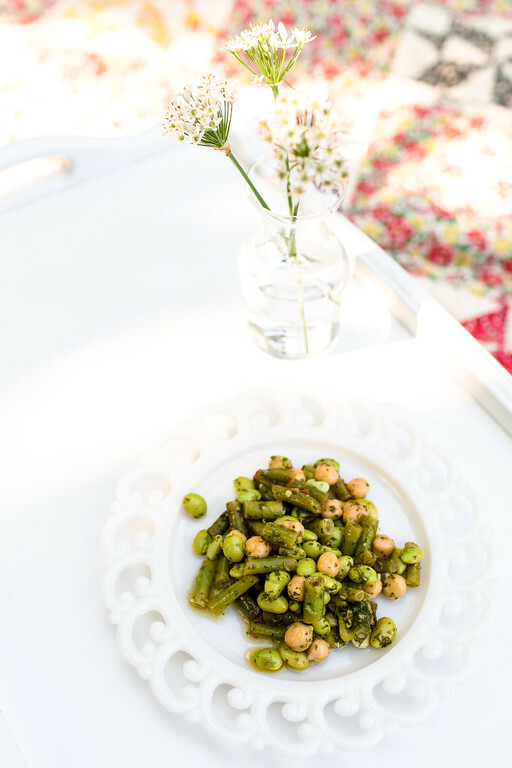 This Three Bean Salad is not you mother's three bean salad - it includes edamame! Cook beans in a large pot of boiling salted water for 6 minutes. Skim them out and immediately place in a ice bath to stop cooking. Scoop out, pat dry, and place in a large bowl. In the same boiling water, cook edamame for 5 to 6 minutes. Follow the same ice bath process as the green beans. Add the chickpeas to the bowl with the green beans and the edamame. Mince the garlic and mash into a paste with a 1/2 teaspoon of salt. Transfer to a blender along with the remaining ingredients. Blend, scraping down the sides until smooth. Add the dressing to the beans and season with salt and pepper to taste. Let stand at room temperature for an hour to let the flavors blend. I can’t wait to try this salad, it looks fantastic! Thanks so much for sharing with Full Plate Thursday and hope you are having a great week! Bring on the cilantro! 😉 This salad looks amazing–love the sounds of that dressing. Much prettier on the plate than the average 3-bean salad too. Thanks for sharing it with Souper Sundays this week. I think you would love this! it seems surprising to me to see a three bean salad with no kidney beans! i don’t mind though–this is fantastic! You don’t miss the kidney beans at all! Now that is my kind of salad, sounds great! Thanks Kalyn, I think you would love it! That Cilantro chile dressing would rock as a marinade for grilled shrimp or chicken. This looks wonderful. One of my kids hates the smell of cilantro so I avoid cooking with it because otherwise I get LOADS of complaints. But this salad might be worth it. Looks great! You could even substitute parsley for the cilantro! When I saw this post in my reader, I had to jump right over here. I love bean salads. So does my husband, and we’re in the cilantro camp. So that will not be a problem. I also wanted to tell you that I’ve made that avocado/mango salad so many times this summer. It’s one of my favorite salads, ever. What a flavor combination. You have to try this salad then, you will love it! HI Pam, love this combination of beans, great salad. Thanks, it really is a wonderful bean salad! My daughter cleaned the fresh veggies from her fridge and brought them with her the last time she came up for 3 days, and cilantro was among the things she brought. I tried it, and wanted to like it, but to me it tasted like dishwater. I’m also not a fan of most beans, so I’ll have to pass, pretty as this looks. I like your garlic chive flowers next to the plate. i LOVE cilantro, just not wild about beans…! I didn’t know you didn’t like beans! Definitely true…you cannot have a picnic without a good bean salad!! Definitely loving the fresh flavors in this one. It’s the law – all picnics must have a bean salad! I think it’s my new favorite three bean salad!